Once you’ve gotten to a certain point in your portraiture work, it can be really fun to start working with agency models. This can be intimidating at first, but super worth it: signed models are generally more experienced and have a level of comfortability in front of the camera. But, how do you actually approach them? Don’t models (and their agencies) always charge? Not necessarily. That’s the first part of this process that can appear complicated. When you’re starting to work with agencies, you can request to do “test” shoots with “new faces,” newer and/or younger models in the agency. These test shoots are unpaid work with something or someone new to “test” it out. In this case, new models are a central part of that. For these shoots neither you nor the models are paid, but you get to build a stronger portfolio or “book” of images that will ultimately get you work. When you think about it, this is a self-fulfilling prophecy: better book means work with better models which means an even better book. 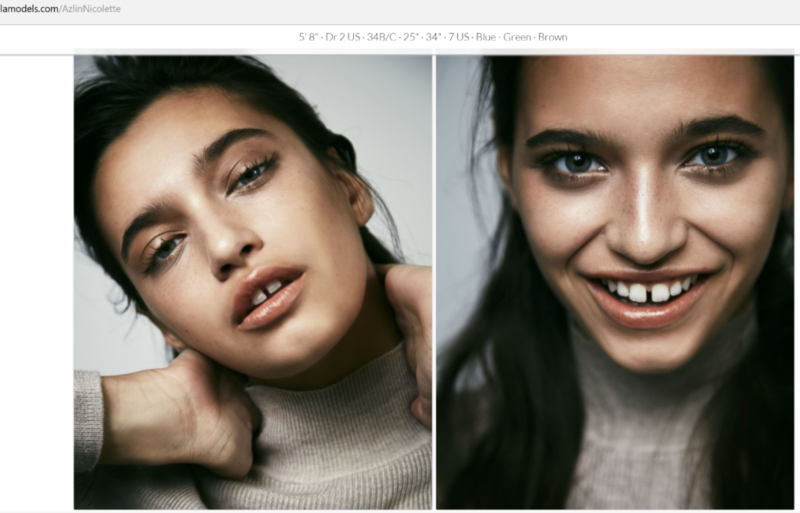 Example of what a modeling agency’s website will look like. These images are also used as the “comp card” of each model. If you click on each girl, you can see a full portfolio. When first pitching to agencies, make your “book” a set of about 10 – 20 of your best images, ideally portraits. These don’t have to be portraits of models per se, but they should be in that style (fashion or lifestyle). Eventually you can work up to bigger agencies like Ford and IMG, but hold tight and work with some smaller agencies for now. Do your research on what the agency you’re pitching to looks for and cater your book to that. To better understand the differences among agencies, check out the following three images. Here are three examples of agencies in Los Angeles; you can tell the different styles of work each agency gravitates towards. These three agencies—Freedom, LA Models, and No Ties—showcase mainly edgy, fashion and lifestyle, respectively. Find an agency that suits the style you want to do, if you can! Now that you have a book and an agency’s information, call the agency! You can always send an email if that’s more comfortable, but phone calls are bigger risk, bigger reward. Agencies are more inclined to respond to a phone call than an email because they get hundreds of emails a day, and you may not have the right representative in the first place (encouraging them to disregard your email entirely). Tell them who you are and what you are interested in, and that you would like to meet with one of their bookers. A “booker” is an employee at an agency who usually has a designated section of models in the agency, such as New Faces. This meeting serves a couple of purposes. The first and foremost is to understand what you’re looking for and what your experience level is. The second is to get a sense of you—so bring your personality, but keep it professional! Bring a business card and dress up. Go in with confidence, since they already have enough interest to spend the time meeting you. If they like what you do and what you stand for, they’ll have you look at some models during that meeting to narrow down some girls you would like to work with. This will be presented on model “comp cards,” portraits of their models on a (literal) card. Or, they’ll send you on your merry way and send you a “package” of girls to choose from based off the style they now know you shoot. This “package” is usually a grouping of 5-10 girls that are available to test. You want to choose 2-3 models from that package, one that you are most interested in and 1-2 backups in the event that something doesn’t work out quite right. 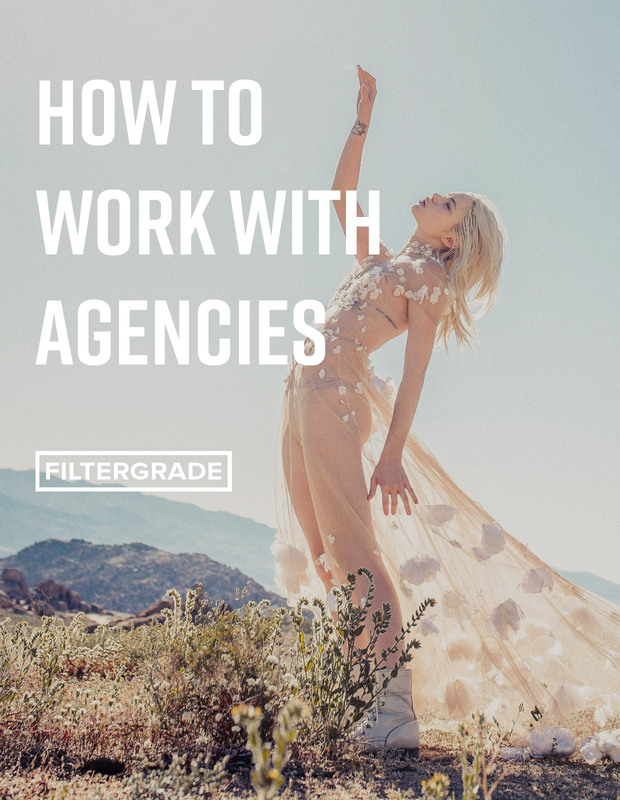 From that point onward, there are a few specific do’s and don’ts to working with agencies that can help you to maintain strong relationships. Send “call sheets” with all the information that the agency and model will need. This includes timing, location, who the team is, and any other details about the shoot. You should also include a “mood board,” a compilation of images denoting your direction and inspiration. Keep in mind that this all needs to be done before the weekend, if that’s when you plan on shooting. Agencies shut down over the weekend, and if you want to change your details, you have to do that beforehand. You should also send your contact information, so that the model can reach you once near set. Until that point, all coordination is between you and the agency. Email a follow-up after the shoot to tell the agent you’re working with about how the shoot went. What was the model like? Was he/she on time? How were his/her movements? They want to know any relevant information about your experience so they can be aware of the professionalism of their models. You should also let the agency know how long it will take you to get photos to them. Within a week or two is ideal, but just let them know whatever you’re thinking. You don’t need to send a ton of photos. 5-10 is ideal, since only about 2-4 will make it into the model’s portfolio anyways. As the other part of the follow-up, thank your models. Be appreciative! They took their time to work with you and that is an incredible opportunity for both of you. Shoot any clothing “for” a brand, unless explicitly cleared with the agency in advance. Many agencies allow shooting for brands for social media usage. However, agencies are there to ensure that their models are paid professional rates and booked for shoots that are right for them. (For those who watch Friends, they don’t want a Joey-Tribiani-STD-poster situation on their hands.) Basically, ask first. Do a modeling release, unless the agency asks you to. Watermark your images. Agencies and models cannot and will not bother with your photos if you watermark them. You’ll just have to trust that nobody will steal your work. Touch the models you’re working with without asking. Once you’ve established that it’s fine, you should be alright, but permission goes a long way—especially for male photographers. Let modeling agencies push you around or force a specific shoot onto you. You are still ultimately doing your own style and that will benefit you most in the end. If it’s not your style, maybe the agency isn’t quite the right fit. Always keep this in mind: how much free work are you providing them, and is it worth your time? These two articles about this same topic really help with more details. Check out part 1 here and part 2 here. Special thanks to Allegra Messina for this article! Allegra Messina is a lifestyle and fashion photographer based in Los Angeles and Seattle. Growing up in Seattle, she developed a love for nature and exploration; she now combines that with her passion for photographing young women like herself. Her work can be found at @messinaphotos or on her website.